The Transputer Development System is a software package which is used for developing occam applications for execution on transputers. The TDS contains facilities for loading and running code on the host computer (which may be a transputer) or on a network of transputers connected to the host. This technical note describes the loading mechanism employed by the TDS to load code onto a network rather than onto the host. Occam contains constructs which are used to specify the allocation of code to different processors in the network. The TDS compiler implements a subset of these allocation facilities which allows users to allocate occam compilation units to different processors. This specification is called the configuration. Two other utilities are used in the process of sending code to a network of transputers, these are the EXTRACT utility and the LOAD NETWORK utility, both of which are described below. The following example configuration specifies a network of two processors which are connected by channel datalink placed on both processors at transputer link zero. The content of the compilation unit root is to be loaded onto the processor attached to the host computer and the content of the compilation unit node is to be loaded onto the other processor in the network. The textually first processor in a network is assumed to be connected to the host computer by a transputer link or serial tine for loading and is referred to as the root processor. The compiler checks that the configuration described by the user is valid and that every processor is loadable from the root processor. The compiler also checks that the code to be loaded to each processor is available and is compiled for the correct processor type. The compiler produces a fold containing a description of the configuration specified by the user. This description is used by the extraction and loading utilities to control the distribution of code to the network. The extraction utility brings together all the different blocks of code to be sent to the network. At the same time bootstraps and routing and loading information is included with the code to initialise the processors and direct the code to the intended locations in the memory of the target processors. The loading utility sends the extracted code to the network, controlling any interaction with the root processor and reporting any failure to the user. The TDS is designed to enable users to develop their network software easily and quickly. This environment calls for a network loading mechanism which is simple, reliable and reasonably efficient. It is expected that applications which require special performance from the loading software, such as loading every processor in a network with identical code but not, perhaps, knowing the topology of the network, would have a specific loading mechanism designed. Any code to be sent to the network should only be transmitted from the host to the network once, even if it is to be loaded at different addresses on different processors. Blocks of code may be loaded in any order to any location on any processor. The loading mechanism should not permanently occupy space in the target processor’s memory. The loading strategy should be reasonably efficient for the number of transputers likely to be used with the TDS - say 500. The loader should be small enough to fit in internal memory so that a processor with large amounts of memory can be loaded via a processor with no external memory. Each type of transputer must be supported. 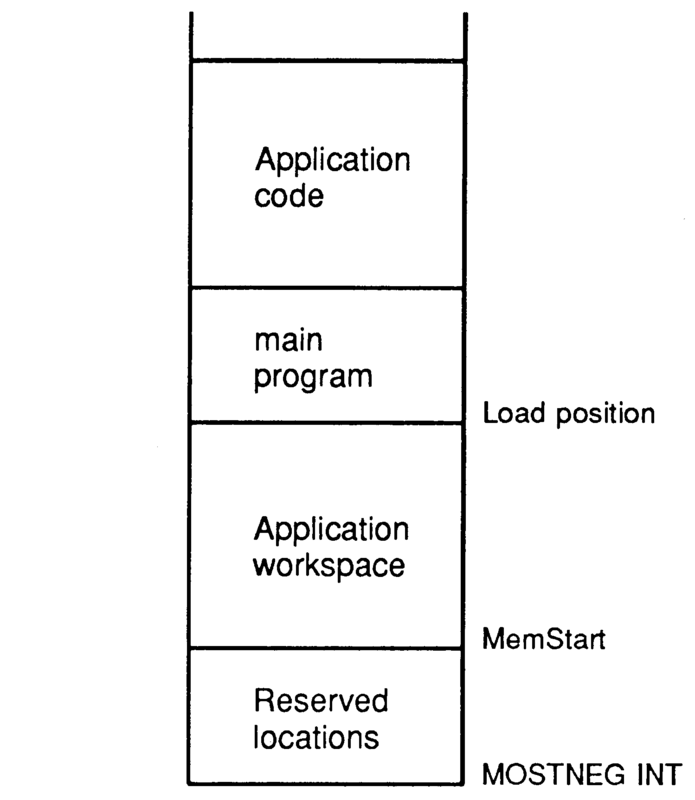 To load code into every processor, it is necessary for a loader to be resident on each processor. This loader must be able to load code into the local memory and also pass code on for other processors. Requirement 1 and requirement 3 above are antagonistic for the design of the loader. Requirement 1 demands a loader which is capable of loading code to other processors when it has finished loading code into the local memory, while requirement 3 demands that space occupied by the loader code can be re-used for code being loaded into the local memory. The sixth requirement, that all types of transputers be supported, had quite a different effect upon the loading scheme. The TDS had to support transputer types which did not boot into the same state and whose external links were at different addresses. This demanded that the bootstrap and loader for each processor in the network be directed to that processor alone. The requirements placed upon the design of the loading scheme resulted in the characteristics described below. Each processor is pre-loaded with a bootstrap and loaders which perform initialisation and loading tasks. The first program, the bootstrap, initialises the registers, the link and event process words and the queue pointers of the transputer and then loads the second program, the bootloader. The bootloader is a simple loader capable of loading code to contiguous blocks of memory, it is used to load the third program, the loader, and later in the load sequence, additional blocks of code not loaded by the loader. The loader performs the tasks of loading code into local memory as well as distributing code and information to other processors in the network. 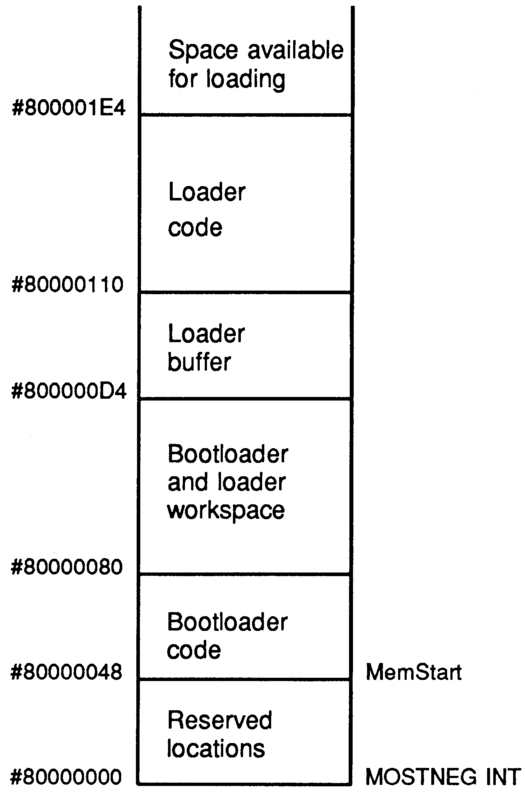 The bootstrap and loaders are grouped together as a set of message packets which are sent to each processor by the host before any other loading information. The development system on the host computer, the TDS, maintains all knowledge of the structure of the network. This allows the loader on each processor in the network to be simple. At each stage it is told exactly what to do by the communications received from the host. The bootstrap and loaders for each processor in the network are transmitted from the host to the processor being booted, they do not propagate from one processor to the next. To all processors, apart from the processor being booted, the bootstrap and loader code is indistinguishable from any other code. Loading code to the network proceeds in distinct phases. Firstly, the bootstrap and loaders for each processor are transmitted from the host in a manner which ensures that a processor which lie on the route to the recipient processor has itself already received its own bootstrap and loader. Secondly, the code to be loaded is transmitted from the host and propagated to all recipient processors. Thirdly, code to call the loaded code is transmitted from the host in a sequence which ensures that a processor which has received its calling sequence will not receive any more loading information from the host and may therefore run this call code. The bootstrap and loaders are loaded onto a processor in the lowest available addresses (nearest to MOSTNEG INT). The code to be run on a processor is loaded so that the most negative addresses will be workspace. 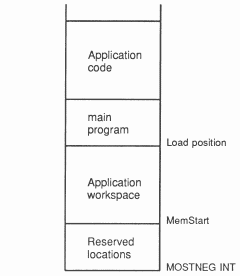 Normally, therefore, the loader resides in memory which will become the workspace of the application being loaded. If, however, there is a requirement to load code into the space occupied by the loader, then the loader can be overwritten by blocks of code loaded by the bootloader after the loader has terminated. The loading messages are collections of single bytes and packets of bytes. The single bytes are commands which control the routing and loading of information. The packets of bytes contain transputer code to be loaded into the memory of a transputer. The packets of bytes are 60 bytes or less. The value 60 was chosen for a variety of reasons. Firstly, it is necessary to provide a buffer in the loader for passing code on to other processors and the larger this is the more space the loader uses. Secondly, a message protocol could be devised which simplified the loader if the message length was never greater than 63. Thirdly, the buffer had to be large enough to contain the bootstrap, which is 53 bytes in length, as a single packet. The extraction and loading utilities, provided as part of the TDS, control the loading mechanism. The extract utility determines the order in which processors are loaded and the location of code loaded on every processor and selects the specific bootstrap and loader for each processor in the network. The loading utility sends the code to the network, controlling any interaction with the root processor and reporting any load failures. The functions of the extraction and loading utilities can be performed as one action within the TDS; the descriptions given in this section will be phrased as if this is the mode of operation being described and the term ’extractor’ will be used for the combined function. This section gives a brief overview of the extractor and the order in which code is transmitted to the network with particular reference to an example. The bootstrap and loaders are described in more detail in later sections. From link connection information and processor load data provided by the compiler, the extractor builds a graph representing the network to be loaded. 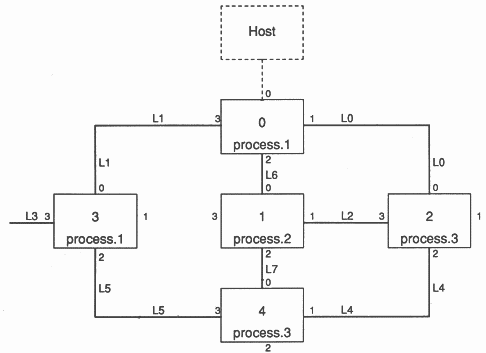 From this data structure the order in which the processors in the network receive the bootstrap and loader code is determined. To determine the order, the graph of the network is first pruned to a strict tree structure with only the shortest paths from the host to all the processors remaining. The order is then determined from the tree by the following algorithm. Boot the root processor (the processor connected to the host). Then for links 0,1,2,3 in turn of the root processor, boot the network attached to the link. If the link is connected to a processor, boot the processor connected to the link, and boot the networks connected to links 0,1,2,3 of the newly booted processor. Note that the links are not necessarily used in the direction defined within the occam configuration. This can be illustrated with reference to the following example configuration. After all of the processors in a network have been booted (loaded with the bootstrap and loaders), the compiled code is transmitted to the network. The code of the procedures to be transmitted to the network is sent in the order in which the procedures are declared in the PROGRAM fold. The loading order is the same as the boot order, each processor taking a copy or not of a code packet, then passing it to zero or more output links. The main program code is sent to the network by traversing the pruned tree representing the network in the following ’depth first’ manner: For links 0,1,2,3 in turn of the root processor, load the network attached to the link. If the link is connected to a ’new’ processor, load the networks connected to links 0,1,2,3 of the new processor, followed by the new processor. Finally load the root processor. A new processor is one which has not previously been encountered during this phase of the loading. The loading position of the code in any processor is determined by the workspace requirement of the code to be loaded to that processor. The load address is calculated by adding the size of the workspace and a base workspace address. If this load address is less than a minimum value, then the minimum value is used as the load address. The minimum value is the lowest address to which code can be loaded onto a processor without overwriting the workspace of the code doing the loading (the bootloader). The workspace requirement on a processor may be small and consequently the calculated load address may overlap the space occupied by the loader program, which resides in low memory addresses (nearest to MOSTNEG INT) as described in the next sections. Rather than adjust the loading address to avoid the loader, the code which overlaps the loader is held back in an internal buffer within the extractor. When the distributing phase of the network load has finished, the saved code is sent to the network with the main body code for each processor. The main bodies are loaded remote processor first, so that a processor receiving a main body will not receive any further load path information. The loader can, therefore, return to the bootloader, which can load contiguous code packets which do not require any load directives. This allows the saved code to be loaded to the space previously occupied by the loader. The bootstrap, bootloader and loader for each processor type are contained within the extractor occam as a table of bytes organised as a sequence of length bytes followed by the specified number of bytes. The table is generated by a program provided with the TDS. This program contains within it a mechanism for inserting transputer instructions directly into the table, and for reading the code of a compiled occam program and adding the intents to the table. The bootstrap and the bootloader are coded directly into the table, the loader is written in occam. The extractor transmits the contents of the table to the network as length byte, code packet pairs. After power-on or reset, a transputer waits until it receives a communication on any one of its links. If the value of the first byte of this communication is 2 or greater, then that number of bytes is input from the link into the memory starting at MemStart and the processor starts executing at MemStart. The TDS extractor sends the bootstrap to each processor as a length byte followed by the bootstrap code. Allocate workspace for bootstrap and loader variables. Reset high and low priority process queues. Clear or set the halt on error flag. Initialise all link and event process words to NotProcess. Initialise some of the loader parameters. The bootstrap is loaded by the transputer at MemStart. 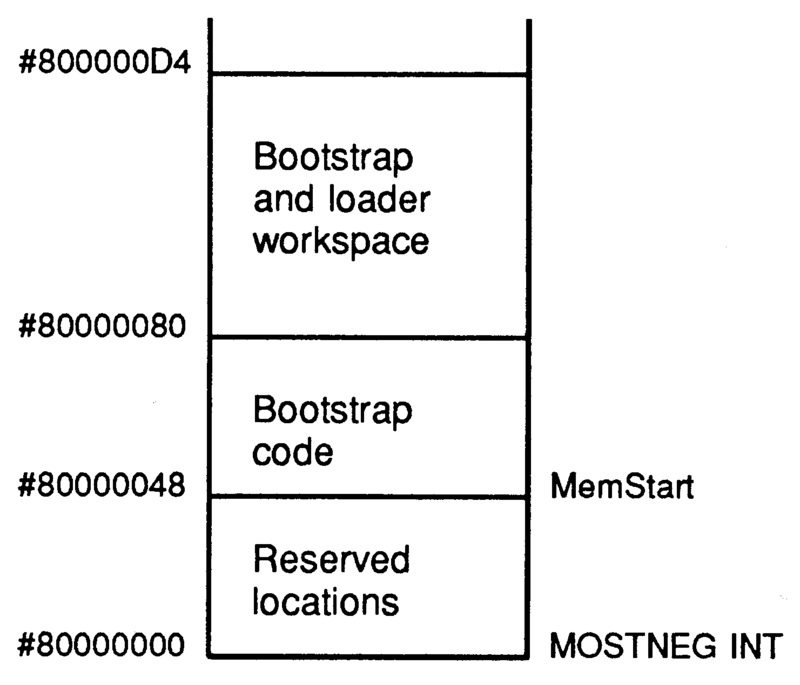 When the initialisation is complete, the bootstrap loads the bootloader at MemStart and then jumps to MemStart to enter the bootloader. Because the bootstrap loads the bootloader at the same location as itself, the bootstrap is at least two bytes longer than the bootloader (so that the instruction by which control is passed to the bootloader is not overwritten by the bootloader code being loaded). The bootstrap for the T4 transputer is 53 bytes in length and the corresponding bootloader is 51 bytes. The memory layout for a T4 transputer while the bootstrap is running is given in the following diagram. Addresses for the T2 and T8 which correspond with those given in the above diagram for the T4 are given in the following table. Initialise remaining parameters for loader. Load code from boot link until terminator. Initialise workspace pointer and call code just loaded. Prepare to load more code. Go to step 2. The main program code loaded does not return, so this loop is only obeyed twice. 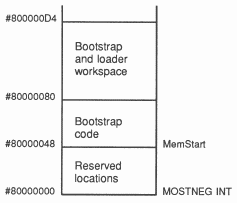 The bootloader is loaded by the bootstrap at MemStart. 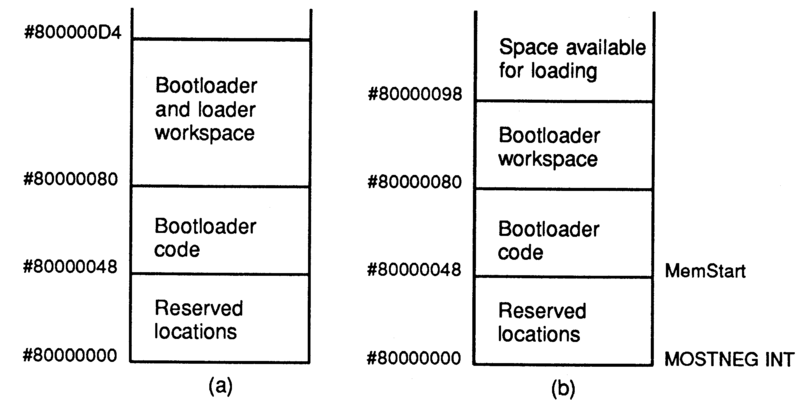 The bootloader creates the loader buffer starting at the address of the variable with the greatest offset in the workspace reserved by the bootstrap. The loader is then loaded at the first free location after the buffer. The bootloader loads the second set of code packets at an address returned by the loader. The messages input by the bootloader are a sequence of length byte and data packet pairs. 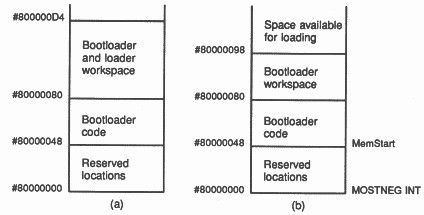 The code position and workspace layout while the bootloader is loading the loader is given in part (a) of figure 4 and the memory layout while the bootloader is loading the final code packets is given in part (b) of figure 4. Load a code packet to the current load address and increment the current load address. Output a code packet to a link. Set a new current load address. Pass commands to a link. The command structure is described in detail in the next section. The information received by the loader from the host is a stream of single byte commands and packets of code. The commands are nested within bracketing command bytes so that each processor can interpret commands for itself, remove one level of bracketing and pass on commands intended for other processors later in the load path. The commands received change the value of variables within the loader. When packets of code are received by the loader, the value of the variables previously affected by the commands determines the destination of the code. The occam source text of the loader is listed in section 7 ’Loader occam’. The memory layout while the loader is running is as follows. Load commands and data transmitted to and through a transputer consist of a word length independent mixture of single bytes and packets of bytes. The single bytes are commands to be interpreted by the loader to control the routing and loading of information, the packets of bytes contain transputer code to be loaded into the memory of a transputer. The bootstrap packets conform to the protocol and thus a processor, which is passing a bootstrap to another processor, cannot detect that bootstrap packets are being transferred. These two bits define the command which should be applied to the current value contained in the operand word after the data part of the command byte has been OR’d into it. The operand word is always cleared after obeying a command other than PREFIX. The operand word contains the size of the message which follows this command byte. The next ’operand’ bytes is the message. The protocol is implemented so that all messages will not exceed 60 bytes in length and thus, not require PREFIXES. The operand word contains a single number. The operand word contains a value that is to be obeyed as an independent command which is not applied to the operand word. The current operand word is shifted left by six places. This allows arbitrary length values to be built. These six bits provide the data (operand) part of the received character. This data is always OR’d into the bottom of the operand word which is used according to the command ode in the top two bits of the received byte. The packets of bytes always follow a MESSAGE command. By making the value of MESSAGE 0 (zero), a MESSAGE command will be interpreted by an unbooted transputer as a length byte and, consequently, bootstrap sequences conform to the command structure. All message packet transfers are sent and received on transputer links as single communications. The loader is an occam program which responds to input commands by altering the value of one or more local variables. These local variables maintain a current load address, a current output link, the set of active output links and whether or not any code received is to be loaded at the current load address. The variable which controls whether code is loaded into memory is initialised to FALSE (FALSE means don’t load, TRUE means load). The loader actions in response to input commands are described in more detail in the following sections. After receiving a message command the message packet is input from the boot link. If the transputer is currently loading, the message is input to the current load address and the current load address is incremented by the size of the message. If the transputer is not currently loading, the message is input into a buffer. The message command and message packet are copied in turn to all the links which are in the set of active output links. The current output link is set to the value of the data part of the number command. The value is also remembered as one of the set of active output links to which code should be copied. The number will not contain prefixes. NUMBERS can also occur following an address function, where they are interpreted as a new loading address as described below. sets the state of the variable which controls whether code is loaded into memory to TRUE. Any future code packets received will be input at the current load address as described for MESSAGE above. The set of active links is reset to none. sets the state of the variable which controls whether code is loaded into memory to FALSE. Any future code packets received will be input into a buffer as described for MESSAGE above. The set of active links is reset to none. indicates that all command bytes received up to but not including a matching CLOSE function should be copied without interpretation to the current link. All commands other than MESSAGE can occur between an OPEN and the matching CLOSE command, including paired OPEN and CLOSE commands. brackets a nested command sequence, matching a previous OPEN function. indicates that the NUMBER which follows should be used as the current load address for future code packets. The address used for loading is an offset in bytes from MOSTNEG INT, rather than the transputer byte address, because access to the memory of the transputer is to an occam array parameter of the loader placed at MOSTNEG INT. ADDRESS is always followed by a NUMBER, the NUMBER may have prefixes. The value of the last address received by the loader is returned to the bootloader and is used as the entry point/initial workspace address of the loaded code. indicates that the distributed phase of the load is finished and the loader returns to the bootloader. TERMINATE will always be preceded by the final load address. The examples which follow show how simple and more complex loading information is encoded and directed, to the recipient transputers for the configuration described in section 2 ’The TDS Extractor’. The symbols used in the examples have the following meaning. The sequence to load only processor 0 is given in the following lines. This load sequence begins with the bootstrap and loaders, these are followed by the first set of code packets which are loaded starting at offset #300 from the most negative address, the next set of code packets are loaded starting at offset #500 from the most negative address and the final set of code packets is loaded starting at offset #230 from the most negative address. The first group of messages and the last group of messages are loaded by the bootloader which terminates on receipt of a message length of 0. The other two groups of messages are loaded by the loader which examines each command to determine the next action and thus does not require a message sequence terminator. Alter the receipt of the terminate operation, the loader is exited and control is returned to the bootloader which has the ability to load sequences of code packets at consecutive addresses. The final parts of the loaded program can overwrite the loader program if necessary. The entry point of the loaded code is always the last address received by the loader. This is also the initial value of the work space pointer. Load instructions for transputers not directly connected to the host are bracketed between an Open and a Close function. Each transputer removes the first and last brackets and passes the contents byte by byte to the current output link. 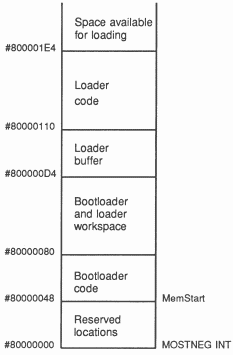 If the load items for processor 0 are not included, the sequence to load processor 2 is given in the following lines. The first line loads processor 2’s bootstrap and bootloader. The Pass command resets the set of active output links and indicates that any future code received should be copied to the set of active output links via the buffer. The next command, the number 1, adds link 1 to the set of active output links and sets link 1 as the current output link. This is followed by the command Open (the open bracket) which causes all items up to but not including the matching Close to be copied to the current output link. Copying the same piece of code to more than one processor is achieved by having a load path for each recipient of the code. This is demonstrated with the following sequence to load processor 4 and processor 3 with the same piece of code, at address #400 on processor 4 and at #500 on processor 3 (note that the example configuration does not allocate the same code to processors 1 and 3). 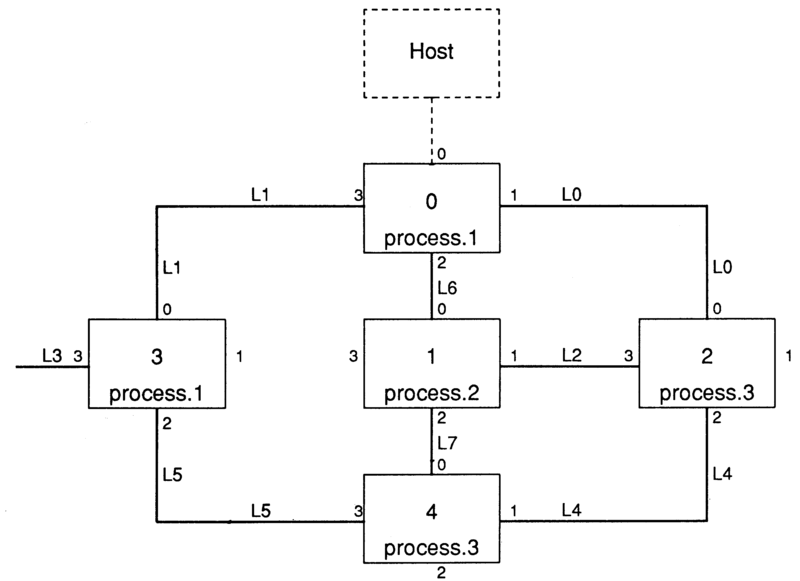 Taking a copy of a code packet and passing it to another processor is achieved by using the load rather than the pass function as is shown by the following sequence to load processor 2 and processor 4 with the same piece of code, at address #900 on both processors. A transputer connected to a host computer by means other than a transputer link must be set to boot from ROM. The ROM code must then receive bootstrap and loading information from the communication medium and perform the load accordingly. Inmos transputer evaluation boards are designed so that a board which is booted from ROM will receive its load commands from an RS232 serial port. Normally only the root processor (i.e. the processor connected to the host) is set to boot from ROM. The Inmos evaluation boards communicate with the host using a standard protocol which is described below. The first three bytes received from the host are used to determine the baud rate of the transmission, the communication mode and the operating function required. Each correct wakeup character read is acknowledged by transmitting an acknowledge (ACK) code to the host computer, an incorrect character is acknowledged with a not acknowledge (NAK) code. The three wakeup sequence bytes are described in more detail below. An initial wake up code (which can be used by the receiving processor to determine the transmission speed of the serial line). If ’B’ is received then all subsequent data is transmitted as full eight bit binary data. If the ’H’ character is received then all subsequent data from the host is to be read in encoded form. This command is used to determine the operating function that the ROM is to perform. ’L’ indicates that a load sequence will follow, ’A’ indicates that an analyse sequence will follow. The analyse sequence is used when the host is interrogating the network to retrieve details of the previous program loaded. Analysing is described in more detail in an accompanying technical note. This function will be received as two ASCII chars if the previous command was an ’H’. The ASCII characters have been chosen so that they are all at least two bits different from each other, and each one has an even number of bits set (even parity with a zero parity bit). Every message packet is followed by another byte value; i.e. messages from the host have one more byte than the number given in the operand word. This extra byte is a checksum value: the checksum is correct if the exclusive or of all the bytes in the message and the checksum itself yields a zero value. If the checksum is correct then the board responds with an ACK to the host; otherwise the board responds with NAK to the host. Checksums and handshaking are not used when communication is via transputer links. The initial workspace requirement is found by reading the workspace requirement from the loader occam and subtracting the size of the workspace used by both the loader and the bootstrap (temp.workspace). This value is incremented by 4 to accommodate the workspace adjustment by the call instruction used to preserve the processor registers. The bootstrap is listed in a transputer assembler format. It was, however, actually developed by using an occam program to encode defined values into a table ready for insertion into the TDS extractor. The bootloader is produced by the same mechanism which produces the bootstrap. Both programs become single message packets preceded by a length byte (which is also a loader MESSAGE command) and are transmitted from the TDS extractor through the network as MESSAGE communications. -- instructions which are never used again. This section lists the occam source of the loader. It is included as part of the extractor table by the program which ’assembles’ the bootstrap and bootloader, as a sequence of MESSAGE command message packet pairs. The component processes of the outer level IF are expanded in the following sections.